What’s allowed into the Heartland Events Center – Grand Island? Answer: Clear, uncolored plastic tote-bags will be permitted, or guest may use a one-gallon clear plastic freezer bag (Ziploc or similar). Additionally, guests may also bring clutch-sized wallets, not exceeding 4.5 inches tall by 6.5 inches long, after proper security screening for arena events. Only one bag is allowed per ticket holder. What is not allowed inside the Heartland Events Center? Answer: No large purses, bags, backpacks or fanny-packs will be permitted inside the venue. Staff members are not allowed to hold or store bags during an event. Answer: No. Everything must be easily visible within the clear plastic bag upon entering the security line. Answer: In the event a patron arrives with an unapproved bag, the bag will not be allowed in to the facility. Answer: Heartland Events Center staff-members are happy to make special accommodations for bags with medical necessity. However, each bag will need to be properly searched by security before entrance. Answer: Arrive early. Doors for events at the Heartland Events Center typically open 60-minutes prior to an event. Lines can get bogged down with last minute arrivals, so budgeting extra time for security can help ensure patrons have plenty of time to get in and find their seats. Where can I purchase an additional clear plastic bag with a Heartland Events Center logo? Answer: A limited number of Heartland Events Center logoed bags will be available for purchase at the Heartland Events Center. They will also be available for sale in the Fonner Park General Offices. Answer: Spectators will be able to carry in other items such as binoculars and cameras, but their cases will not be allowed. Binoculars and cameras will be screened at the security checkpoint. Are seat cushions allowed to be carried in? Answer: No. Due to the configuration of the Heartland Events Center, seat cushions are not a necessity. Does this policy apply to Heartland Events Center Staff? Answer: Working personnel, including accredited news media, will enter through designated doors where they will be subject to screening and bag inspections of the same manner. 1. Any type of weapon, fake weapon, or object resembling a weapon. This includes but is not limited to handguns, rifles, knives, straight edge razors, brass knuckles, swords, dangerous ordinance, Tasers, chains, and all other categories of weapons, whether such items are real or replica weapons. This includes permit holders possessing or carrying lawfully concealed weapons in or around the facility. Weapons cannot be checked in to Security or Guest Services. 2. Alcohol / Drugs / Illegal Substances / Vaporizing Pens / Smoking / E-cigs. The Heartland Events Center operates as a smoke free facility. If your conduct endangers or disrupts guests or others involved in the event, the Heartland Events Center reserves the right to remove you from the premises. Auxiliary vehicles, including but not limited to, golf carts, service carts, utility vehicles, Cushmans, and other four-wheeled vehicles (individually an "AV," collectively, "AVs") are included within the scope of this Motorized Vehicle Rules & Regulations Agreement (this "Agreement"). All AVs used in connection with activities and events at the Fonner Park Campus are required to have a Fonner Park issued operation permit while on the Fonner Park grounds, parking lots, and campground. Permits are required during move-in, event period, and move-out. 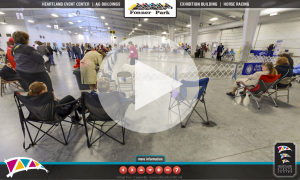 Permits are only issued for AVs that serve to advance the operation of the event in process or that provide a service to Fonner Park vendors, exhibitors, administration staff, etc. Permits are not issued to the general public. AV permits are at no cost. Permits are issued at the Fonner Park General Office. Permits are issued at the discretion of Fonner Park and Double Locked Security. A Certificate of Liability Insurance evidencing the insurance required in this Agreement, naming the following entities (verbatim) as additional insureds (collectively, the "Additional Insured's"), is required for the AV at the time the undersigned applies for a permit. "It is the intent of this company to provide a safe workplace for everyone. Accident and injury prevention is an important part of our job. Working together, we can achieve our safety goals. Safe working practices are important. Safety is everyone’s responsibility. It is the policy of this company to protect our employees, patrons, equipment, facilities, and grounds. Employees and vendors operating AVs must be authorized to drive the vehicle, and constantly be aware of others when driving on the Fonner Park grounds." 1. AVs without a permit will not be allowed on Fonner Park grounds at any time. 2. High-powered motorized sports vehicles and AVs over 52" wide are not permitted. This Agreement authorizes the undersigned to operate only the AV identified at the end of this Agreement. Privately owned AVs are subject to inspection and approval of Fonner Park or Double Locked Security prior to use on the Fonner Park grounds. 3. All AV drivers must be a minimum of 16 years of age and have a valid driver’s license issued by the applicable state agency. An identification card is not considered a valid form of I.D. A copy of the driver’s license must be on file with this signed Agreement. 4. AVs are not permitted on city streets. However, all drivers of AVs shall observe all Nebraska motor vehicle traffic laws while driving an AV (e.g. stopping at stop signs, yielding to pedestrians, refraining from using cell phones or texting while driving). AVs may only be driven between dawn and dusk if equipped with headlights and brake lights in operating condition. 5. AVs are not permitted inside any Fonner Park buildings or barns, at any time. 6. In accordance with Nebraska motor vehicle traffic laws, the consumption of, or driving under the influence of any alcohol, narcotic drug or any illegal substance while operating an AV on Fonner Park grounds is illegal. Any violations will result in the automatic revocation of your AV permit. 7. AV drivers will yield to pedestrians and animals, and use safe speeds at ALL times, especially in areas of high traffic. An AV should be operated at a speed equivalent to a well-paced walk, but no faster than 15 mph. 8. The number of passengers and load capacity of an AV shall not exceed the manufacturer’s rated limit and all passengers must be transported in accordance with the manufacturer’s recommendations. Passengers must be seated while operating the AV. Infants and children are not allowed on the driver’s lap and are not allowed to steer the AV. Passengers are not allowed to ride in the box of the AV. 9. AV keys are not to be left in unattended AVs. Drivers must keep their AV keys with them at all times. 10. The undersigned shall maintain a liability insurance policy with respect to the operation of the AV with a combined single limit of at least $1,000,000 per occurrence for bodily injury, including death and property damage coverage. Such policy shall be in force on the date hereof and shall remain in force through the undersigned’s move-in, during the event, and through the undersigned’s move-out. 11. The undersigned is fully responsible for the operation of any AV he or she operates in connection with the said party’s event, and assumes all liability relating to such AV operation. The under-signed acknowledges that Fonner Park, by providing this privilege, is in no way endorsing the operation of an AV and does not and will not assume any liability relating to the operation thereof. The undersigned hereby agrees to indemnify, defend and hold harmless Fonner Park, the Additional Insureds, and their respective directors, officers, managers, members, employees, and any-one acting by or on behalf of the foregoing, from any losses, demands, claims or injuries in any manner relating to or arising out of the storage, use or operation of an AV in connection with Fonner Park, including but not limited to any breach of this Agreement.  Fonner Park and Double Locked Security each have the authority to revoke an AV permit at their sole discretion.  Fonner Park and Double Locked Security each have the authority to impound any AVs issued by the Fonner Park and Double Locked Security, in their sole discretion.  Fonner Park and Double Locked Security each have the authority to require any privately owned AVs to be removed from the Fonner Park grounds, in their sole discretion.  A first time violator of any of the terms of this Agreement may receive a warning if the circum-stances warrant, in the sole discretion of Fonner Park and Double Locked Security . In such event, a second violation will result in the automatic and immediate revocation of the driver’s AV permit and the AV will be impounded, if such AV was issued by Fonner Park and Double Locked Security. Privately owned AVs will be required to be removed from the Fonner Park grounds.  Reckless driving, negligent driving or any other driving that may impair or be harmful to the safety of visitors, participants, vendors, exhibitors, or others present at Fonner Park (each of the foregoing as determined by Fonner Park and Double Locked Security in their sole discretion), shall result in the automatic revocation of a driver’s AV permit and the AV will be impounded, if such AV was issued by the Fonner Park and Double Locked Security . Privately owned AVs will be required to be removed from the Fonner Park grounds.  Permits are issued at the discretion of Fonner Park and Double Locked Security . Fonner Park and Double Locked Security reserve the right to revoke permits and remove AVs from Fonner Park grounds, at any time and for any reason. I hereby certify that I have read and agree to the above Fonner Park Motorized Vehicle Rules & Regulations, I have provided the required insurance rider and a copy of my valid driver’s license.